Kevin Smith literally made a name for himself when he directed, produced, wrote, edited and partly starred in this quirky film. “Clerks” is a story about the day to day life of people working in a convenience store. The piece is not only about the workers of the convenience store but also its frequent visitors. The film became a cult hit because of its unique story line, and black-and-white shooting style. Set in a school, The Breakfast Club is not only one of the iconic films of the 80s; it also shot several actors to fame. The film is about 5 teenagers who each have a well defined character type, from the geek, to the popular guy and the criminal. All of the children get into trouble and are forced to spend a Saturday in detention at the school. At the start of the film the teenagers do not want to converse with each other because they are from different social groups however as the film progresses they learn to see past their character types and become friends. Phone Booth is the Joel Schumacher thriller about a man who has to stay in a phone booth for 90 minutes or his family will be killed. Audiences watch as Stuart Shepard (Colin Farrell) battles with a mystery killer on the other end of the phone. Despite its single location the director of photography managed to capture some stunning shots of a rainy day in New York and the director tells a very emotional story. Seen all four movies, but my favorite one is Phone Booth. Never imagined that I could sit and watch a movie where a guy has a telephone conversation for over an hour. It has been the most thrilling, intense and full of suspense movie I have seen so far. And seen it couple of times as well! And Colin Farrell is a good looking actor who played his role amazingly! Phone booth was a very good movie. The location, actors, and the scenes were amazing. Colin Farrell did a wonderful job and I am definitely going to watch this movie again, after reading this article. What can I say about Phone Booth, personally it is not for me, I am more of an Alfred Hitchcock fan. My favourite of all time has to be the Birds! 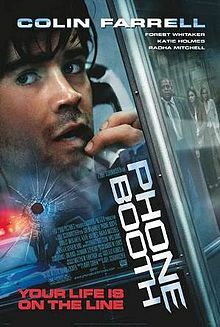 Phone Booth was a good film, I found it quite interesting. Another film set in the same location (from what I can remember) is Dogville, starring Nicole Kidman. It was a very good film and Nicole proved once again (if needed) that she is a very good actress.